The second model construction phase is more difficult to achieve because, while age dating the continental crusts exists in detail, its use in model construction is complicated by many overprinting phases of sedimentary deposition, erosion, metamorphism, and tectonism. During this extended interval of ancient time–around 3,750 million years, on an Expansion TectonicEarth there were also no preserved volcanic seafloor crusts to guide crustal assemblage. Spherical Archaean to future Expansion Tectonic small Earth models. Models show relative increase in Earth radii over time showing both continental and seafloor geology. Models range in age from the Archaean to the present-day, plus one model projected 5 million years into the future. Instead, during this construction phase an identified global network of continental sedimentary basins is used. During model construction, by moving back in time the radius of each succeeding model is progressively reduced in small, incremental stages. An equivalent area of the youngest sedimentary and magmatic rocks remaining is then removed from the model under construction and returned to the ancient lands or mantle–from where they originally came from. This method is justifiable because the younger crustal rocks represent sedimentary and magmatic rocks that were deposited, intruded, or extruded after the older crustal rocks were first formed. During progressive removal of the younger rocks, each of the sedimentary basins are then restored to a pre-stretching or pre-rift configuration and all sediments and magmatic rocks are simply returned to the exposed land surfaces or mantle. This network of sedimentary basins is then progressively reduced in surface area until only the most ancient Precambrian continental crustal rocks remain. This second modelling phase extends small Earth model coverage back in time, before the early-Triassic Period, to the beginning of the Archaean Eon—around 4,000 million years ago, as shown above. Modelling the continental crusts has never been done before, for any tectonic theory, and these models are therefore unique. 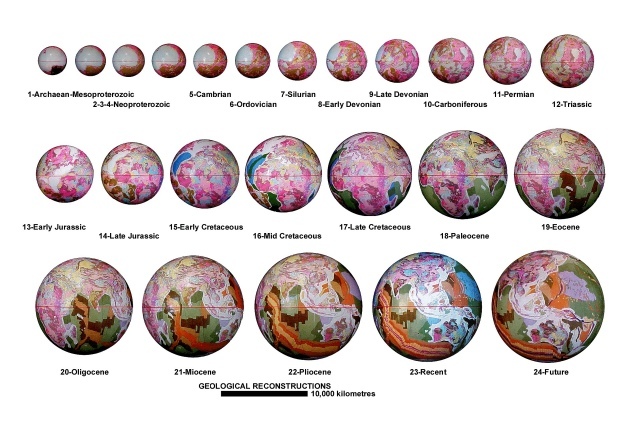 While this outline of small Earth model construction may appear brief, the actual construction methodology is quite basic: the area of each coloured stripe or sedimentary basin is simply progressively removed in turn and the remaining crustal plates are re-assembled on predetermined smaller radius Earth models. The method of constructing small Earth models adopted here results in a series of models that adhere precisely with the coloured time-stripes, as depicted in the seafloor mapping, as well as the distribution of continental sedimentary basins and other domains within continental crusts. This modelling study empirically demonstrates that all continental crusts assemble as a complete Pangaean Earth at approximately 50 percent of the present Earth radius during the late-Permian-–around 250 million years ago. Similarly, by extending this modelling philosophy back in time to the Precambrian times, remnant ancientProterozoic and Archaean continental crusts are shown to assemble together as a primordial Earth at approximately 27 percent of the present Earth radius during the early-Archaean.